As we have discussed, when a motorcycle accelerates, load is transferred to the rear and increases the weight or load on the rear suspension. This acts to compress the rear suspension just as forward weight transfer under braking acts to compress the front suspension, causing the motorcycle to squat under acceleration. By using characteristics of the rear suspension design and the layout of a typical chain drive, however, we can give the motorcycle anti-squat geometry tendencies that offset the compression from load transfer, in turn improving handling performance on corner exits as the motorcycle accelerates. There are two forces that work to extend the suspension to counter squat during acceleration. One is driving force from the rear tire, which pushes the axle forward, while the other is the drive chain, which pulls the axle forward and down in the direction of the top chain run. The three forces we are concerned with during acceleration are weight transfer (green), driving force (blue) and chain pull (red). Driving force acts horizontally on the axle, and is equal to the amount of acceleration. If the swingarm slopes up from the axle toward the front of the machine and the pivot, driving force will extend the suspension; however, deep in the travel the swingarm may slope down toward the front of the machine, and driving force will serve to compress the suspension further. Chain pull force also acts on the axle, and its direction also changes as the suspension moves through its travel. The magnitude of the chain force is proportional to the driving force in relation to the rear sprocket size and rear tire diameter. Chain pull generally serves to extend the suspension (picture the chain attached to the axle itself rather than the sprocket, and the effective line of force runs below the swingarm), but like the driving force and swingarm angle, may work to compress the suspension at extreme travel. There are three ways to put a numerical value on anti-squat geometry. One is to determine how much of the squat force the anti-squat forces offset, and express that as a percentage. To calculate anti-squat using this method, we can consider the three forces involved – weight transfer, driving force and chain pull – and calculate their moments, or torques, about the swingarm pivot. Because the actual mass of the motorcycle and the acceleration value are part of all three torques, these terms cancel out from the individual calculations. 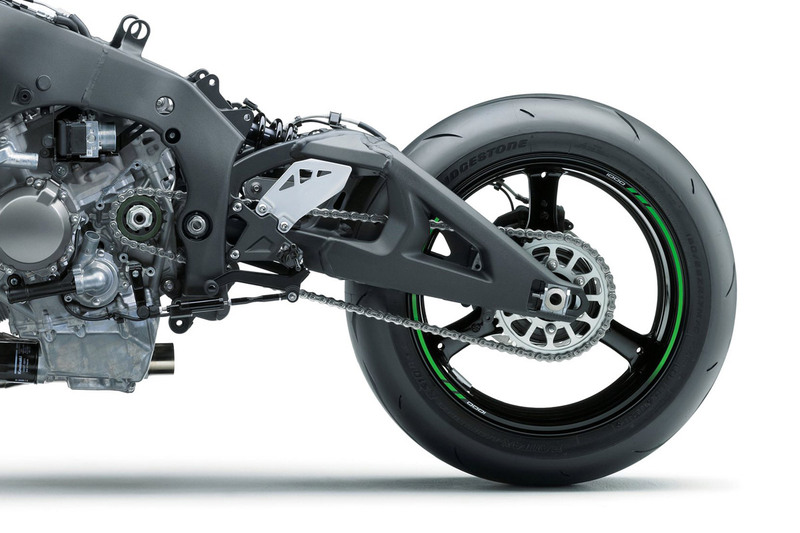 The additional weight on the rear suspension has a magnitude dependent on the horizontal and vertical position of the center of gravity (see Front and Rear Weight for a full explanation), and acts vertically at a distance equal to the swingarm length, measured parallel to the ground. The driving force acts horizontally, at a distance of the height difference between the rear axle and swingarm pivot. This height decreases as the suspension compresses, and the driving force torque will decrease and may go negative at some point. 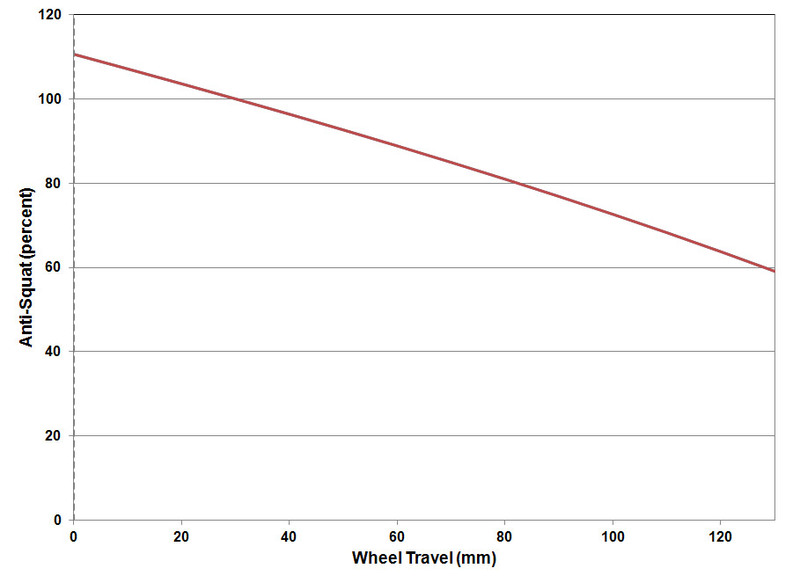 A typical plot of anti-squat expressed as a percentage of weight transfer vs. suspension travel. Note that anti-squat is greater than 100 percent close to the top of the travel, and steadily decreases as the suspension moves through its stroke. At approximately 30mm of travel – the static sag measurement – anti-squat is close to 100 percent. The force from the chain pull is equal to the driving force multiplied by the ratio of the rear tire diameter to rear sprocket diameter. This force acts on the axle, and the distance used to calculate the moment is the distance between the swingarm pivot and an imaginary line through the rear axle and parallel to the top chain run. 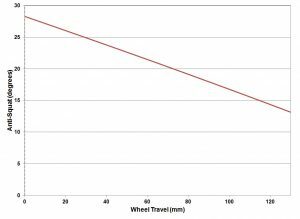 Again, note that this distance decreases as the suspension compresses, in turn decreasing the torque from the chain pull. Determining the anti-squat percentage is a matter of dividing the sum of the anti-squat torques by the weight transfer torques. Note that if anti-squat was 100 percent, the chain and driving forces would perfectly offset the weight transfer of acceleration, and the rear suspension would neither extend nor compress. A number less than 100 percent wound indicate that anti-squat forces are less than the weight transfer forces, and the suspension would compress during acceleration; conversely, a number greater than 100 percent would indicate the rear suspension will rise under acceleration. Note that because all the forces are proportional in some way to acceleration, the same anti-squat number covers any acceleration value. The second method of calculating anti-squat comes from Tony Foale and his book, Motorcycle Handling and Chassis Design: The Art and Science, which outlines a method of determining anti-squat percentage graphically. 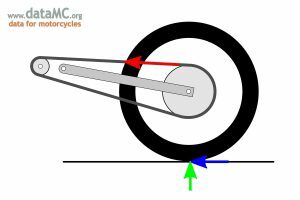 Consider a line drawn through the swingarm pivot and parallel to the swingarm, and another line drawn along the top chain run. These lines will intersect at some imaginary point, typically somewhere in front of the front sprocket. A third line, drawn from the rear tire’s contact patch and through this intersection point, will intersect a fourth line drawn vertically from the front tire’s contact patch. The height of this intersection point, expressed as a percentage of the height of the center of gravity, is equal to the anti-squat value. This assumes that the center of gravity is mid-way between the axles, which is a reasonable assumption for most sport bikes and racing machines. Using this method results in a percentage value identical to that calculated by summing moments around the swingarm pivot, provided the CG position assumption is made. An imaginary line (grey dashed) is drawn from the rear tire’s contact patch through the intersection point of lines drawn through the swingarm and top chain run (red). The angle of this line (ø) is the anti-squat angle. Anti-squat can also be expressed as a percentage, represented graphically as the height of the aforementioned intersection line at the front wheel (y) as a percentage of the center of gravity height. A third way of calculating and expressing anti-squat is as an angular value. Here, the angle of the line from the rear tire’s contact patch through the intersection of the lines drawn through the swingarm and top chain run is used. A greater angle indicates more anti-squat, and vice-versa. This removes the center of gravity position entirely from the expression, and will not reflect geometry changes the same way an anti-squat percentage value may. For example, if we were to raise the center of gravity or change its horizontal position without making any other geometry changes, the anti-squat angle does not change but the anti-squat percent number will decrease. 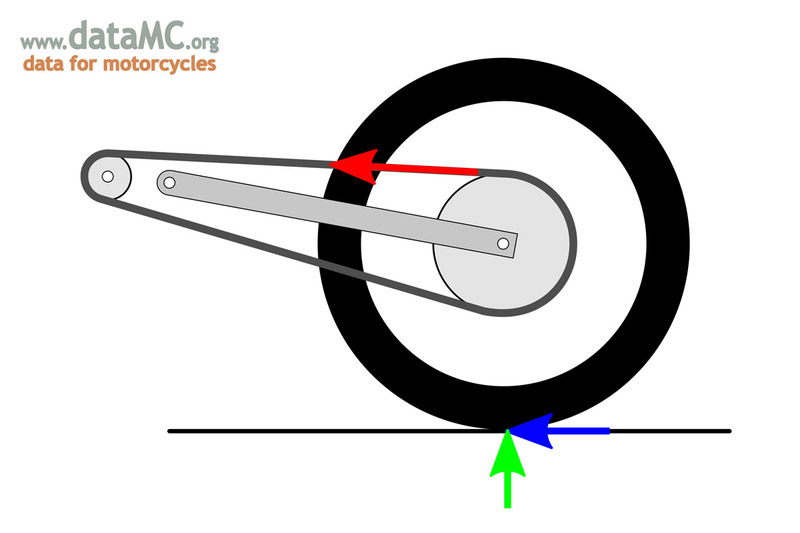 Conversely, if we were to raise the entire motorcycle on its suspension, the anti-squat angle would increase a corresponding amount as the swingarm angle would increase; however, the anti-squat percent number would increase a smaller amount, as the center of gravity also raises with this geometry change. Anti-squat expressed as an angle vs. suspension travel. 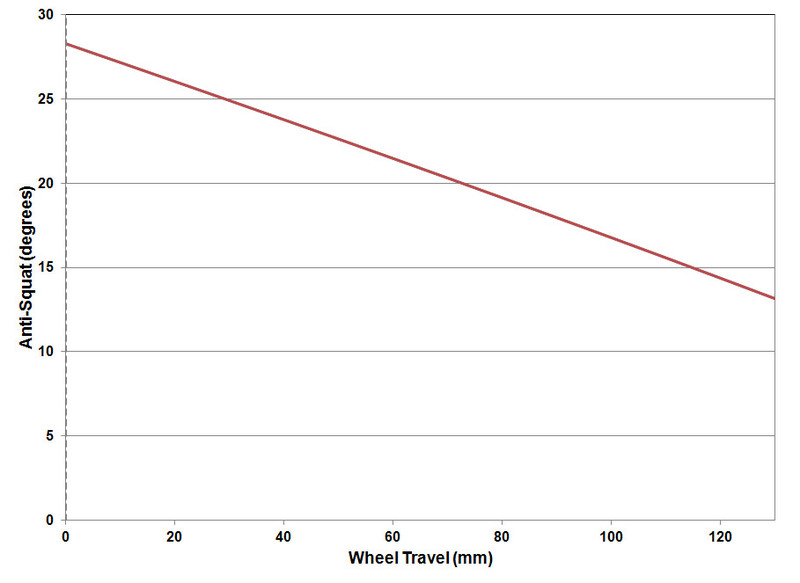 In both charts, the assumption is made that front and rear suspension are compressed an equal amount. Note that, in terms of gearing changes, if the gearing ratio is the same, larger or smaller sprockets have little effect on anti-squat. For example, changing from 15-45 to 16-48 gearing gives the same ratio (3:1); the top chain run is now higher, reducing anti-squat, but the chain angle is steeper, increasing anti-squat and almost perfectly offsetting the change in height of the chain run. Ideally, the anti-squat value would increase as the suspension travel increases, giving the suspension additional anti-bottoming resistance as it approaches maximum stroke. Unfortunately, this is not the case, and due to the changes in geometry as the suspension compresses, the anti-squat angle and percentage typically decrease as suspension travel increases. This means that at the top of the stroke, anti-squat will work to prevent the suspension from compressing, but deeper in the stroke there is less anti-squat to prevent the suspension from compressing too much. This is why anti-squat is so important to setup: Small changes in geometry and anti-squat can significantly affect how the rear suspension works. Use our motorcycle anti-squat calculator to learn more about anti-squat and see exactly how geometry changes affect anti-squat. DataMC is your online resource for motorcycle data acquisition and chassis dynamics. Learn how to analyze your data, improve your setup using that data, and take your riding to the next level.